The Palace of Versailles, Château de Versailles, or simply Versailles (English /vɛərˈsaɪ/ vair-SY or /vərˈsaɪ/ vər-SY; French: [vɛʁsaj]), is a royal château in Versailles in the Île-de-France region of France. First built by Louis XIII in 1623 as a hunting lodge of brick and stone, the edifice was enlarged into a royal palace by Louis XIV. The first phase of the expansion (c. 1661–1678) was designed and supervised by the architect Louis Le Vau. It culminated in the addition of three new wings of stone (the enveloppe), which surrounded Louis XIII's original building on the north, south, and west (the garden side). After Le Vau's death in 1670, the work was taken over and completed by his assistant, François d'Orbay. 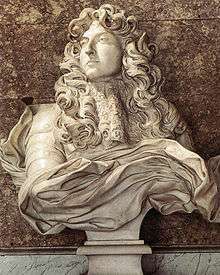 Charles Le Brun designed and supervised the elaborate interior decoration, and André Le Nôtre landscaped the extensive Gardens of Versailles. Le Brun and Le Nôtre collaborated on the numerous fountains, and Le Brun supervised the design and installation of countless statues. During the second phase of expansion (c. 1678–1715), two enormous wings north and south of the wings flanking the Cour Royale (Royal Courtyard) were added by the architect Jules Hardouin-Mansart. He also replaced Le Vau's large terrace, facing the garden on the west, with what became the most famous room of the palace, the Hall of Mirrors. Mansart also built the Petites Écuries and Grandes Écuries (stables) across the Place d'Armes, on the eastern side of the château, and, in 1687, the Grand Trianon, or Trianon de Marbre (Marble Trianon), replacing Le Vau's 1668 Trianon de Porcelaine in the northern section of the park. Work was sufficiently advanced by 1682, that Louis XIV was able to proclaim Versailles his principal residence and the seat of the government of the Kingdom of France, and also to give rooms in the palace to almost all of his courtiers. After the death of his consort Maria Theresa of Spain in 1683, Louis XIV undertook the enlargement and remodeling of the royal apartments in the original part of the palace, the former hunting lodge built by his father. 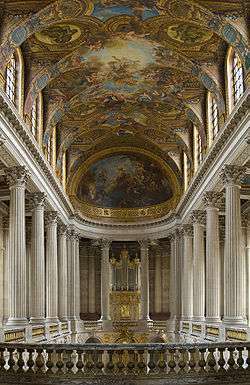 The Royal Chapel of Versailles, located at the south end of the north wing, was begun by Mansart in 1688, and after his death in 1708, completed by his assistant Robert de Cotte in 1710. Estimates of the amount spent to build Versailles are speculative. An estimate in 2000 placed the amount spent during the Ancien Régime as US$2 billion, this figure being, in all probability, an under-evaluation. France's Fifth Republic expenditures alone, directed to restoration and maintenance at Versailles, undoubtedly surpass those of the Sun King. During the French Revolution, after the royal family's forced move to Paris on 6 October 1789 three years before the fall of the monarchy, Versailles fell into disrepair and most of the furniture was sold. Some restoration work was undertaken by Napoleon in 1810 and Louis XVIII in 1820, but the principal effort to restore and maintain Versailles was initiated by Louis-Philippe, when he created the Musée de l'Histoire de France, dedicated to "all the glories of France". The museum is located in the Aile du Midi (southern wing), which during the Ancien Régime had been used to lodge the members of the royal family. 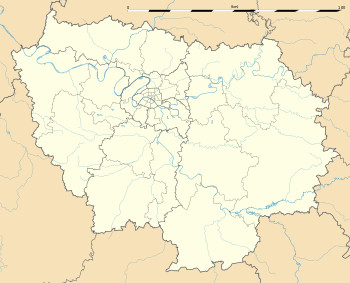 It was begun in 1833 and inaugurated on 30 June 1837. Its most famous room is the Galerie des Batailles (Hall of Battles), which lies on most of the length of the second floor. The Fifth Republic has enthusiastically promoted the museum as one of France's foremost tourist attractions, with recent figures stating that nearly five million people visit the château, and 8 to 10 million walk in the gardens, every year. 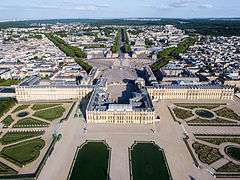 In 2003, a new restoration initiative – the "Grand Versailles" project – was started, which necessitated unexpected repair and replantation of the gardens, which had lost over 10,000 trees during Hurricane Lothar on 26 December 1999. The project will be on-going for the next seventeen years, funded with a state endowment of €135 million allocated for the first seven years. It will address such concerns as security for the palace, and continued restoration of the bosquet des trois fontaines. Vinci SA underwrote the €12 million restoration project for the Hall of Mirrors, which was completed in 2006. 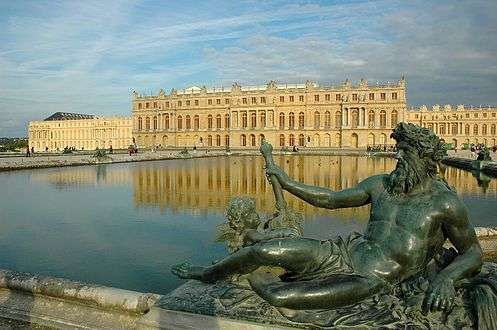 On 6 May 1682, Versailles became officially the seat of the government of the kingdom of France, the home of the French king, Louis XIV, and of the location of the royal court. Symbolically, the central room of the long extensive symmetrical range of buildings was the King's Bedchamber (La Chambre du Roi), which itself was centred on the lavish and symbolic state bed, set behind a rich railing. Indeed, even the principal axis of the gardens themselves was conceived to radiate from this fulcrum. All the power of France emanated from this centre: there were government offices here; as well as the homes of thousands of courtiers, their retinues and all the attendant functionaries of court. 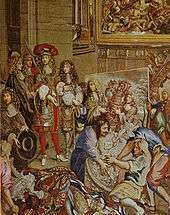 By requiring that nobles of a certain rank and position spend time each year at Versailles, Louis XIV prevented them from developing their own regional power at the expense of his own, and kept them from countering his efforts to centralize the French government in an absolute monarchy. 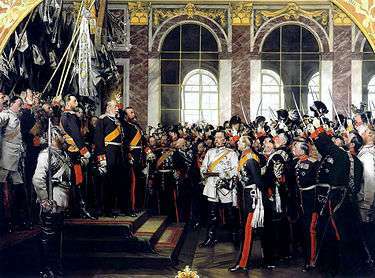 At various periods before Louis XIV established absolute rule, France, like the Holy Roman Empire lacked central authority and was not the unified state it was to become during subsequent centuries. During the Middle Ages, French nobles were often more powerful than the King of France and, although technically loyal to him, they possessed their own provincial seats of power and government, culturally influential courts and armies loyal to them, not to the king, and the right to levy their own taxes on their subjects. Some families were so powerful, they achieved international prominence and contracted marriage alliances with foreign royal houses to further their own political ambitions. Although nominally Kings of France, de facto royal power had at times been limited purely to the region around Paris. Life at Versailles was determined by position, favour and, above all, one's birth. The chateau was a sprawling cluster of lodgings for which courtiers vied and manipulated. 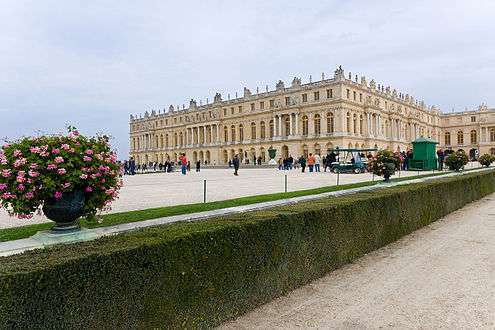 Today, Versailles is seen as unparalleled in its magnificence and splendour, yet few know of the actual living conditions many of Versailles' privileged residents had to endure. Many modern historians have compared the palace to a vast, crowded apartment block. Apart from the royal family, the majority of the residents were senior members of the household. Louis XIV envisaged Versailles as a seat for all the Bourbons, as well as his troublesome nobles. These nobles were, so to say, placed within a "gilded cage". 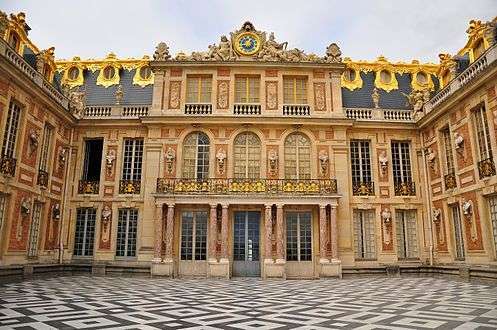 Many of the apartments were far from luxurious with many nobles having to make do with one or two room apartments, forcing many of them to build or buy town-houses in Versailles proper while keeping their palace rooms for changes of clothes or entertaining guests, rarely sleeping there. 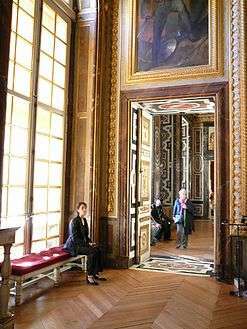 Rooms at Versailles were immensely useful for ambitious courtiers, as they allowed palace residents easy access to the monarch, essential to their ambitions, and gave them direct links to the latest news and gossip. The palace, however, still serves political functions. 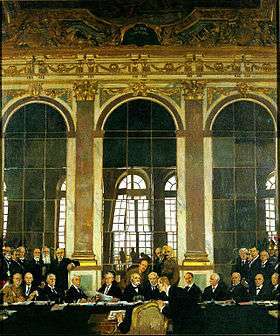 Heads of state are regaled in the Hall of Mirrors; the bicameral French Parliament—consisting of the Senate (Sénat) and the National Assembly (Assemblée nationale)—meet in joint session (a congress of the French Parliament) in Versailles to revise or otherwise amend the French Constitution, a tradition that came into effect with the promulgation of the 1875 Constitution. For example, the Parliament met in joint session at Versailles to pass constitutional amendments in June 1999 (for domestic applicability of International Criminal Court decisions and for gender equality in candidate lists); January 2000 (ratifying the Treaty of Amsterdam), and in March 2003 (specifying the "decentralized organization" of the French Republic). In 2009, President Nicolas Sarkozy addressed the global financial crisis before a congress in Versailles, the first time that this had been done since 1848, when Charles-Louis Napoleon Bonaparte gave an address before the French Second Republic.Following the November 2015 Paris attacks, President Francois Hollande gave a speech before a rare joint session of parliament at the Palace of Versailles. This was the third time since 1848 that a French president addressed a joint session of the French Parliament at Versailles. The president of the National Assembly has an official apartment at the Palace of Versailles. The palace that we recognize today was largely completed by the death of Louis XIV in 1715. The eastern facing palace has a U-shaped layout, with the corps de logis and symmetrical advancing secondary wings terminating with the Dufour Pavilion on the south, and the Gabriel Pavilion to the north, creating an expansive cour d'honneur known as the Royal Court (Cour Royale). Flanking the Royal Court are two enormous asymmetrical wings that result in a facade of 1,319 feet in length. Encompassing 721,182 square feet (67,000.0 m2) the palace has 700 rooms, more than 2,000 windows, 1,250 fireplaces and 67 staircases. As a result of Le Vau's enveloppe of Louis XIII's former hunting lodge transforming it, between 1631 and 1634, into a red brick and white stone small château, with a black tile roof, the king and the queen had new apartments in the new addition, known at the time as the château neuf. The grands appartements (Grand Apartments, also referred to as the State Apartments) are known respectively as the grand appartement du roi and the grand appartement de la reine. They occupied the main or principal floor of the château neuf, with three rooms in each apartment facing the garden to the west, and four facing the garden parterres to the north and south, respectively. Le Vau's design for the state apartments closely followed Italian models of the day, as evidenced by the placement of the apartments on the next floor up from the ground level—the piano nobile—a convention the architect borrowed from 16th- and 17th-century Italian palace design. 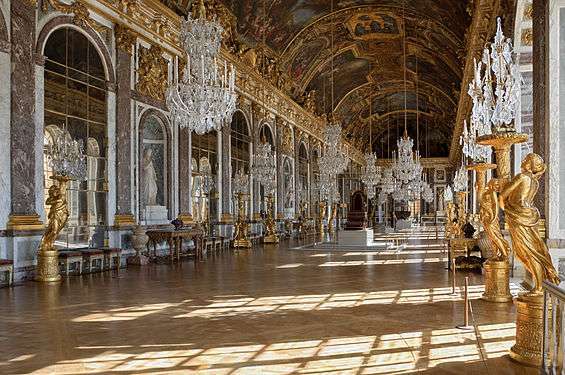 The galerie des glaces (Hall of Mirrors in English), is perhaps the most celebrated room in the château of Versailles. 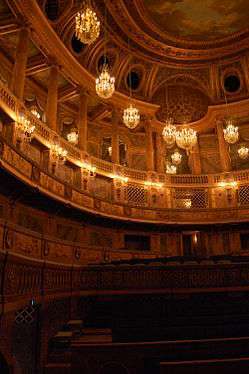 Setting for many of the ceremonies of the French Court during the Ancien Régime, the galerie des glaces has also inspired numerous copies and renditions throughout the world. In the 19th century the "Museum of the History of France" was founded in Versailles, at the behest of Louis-Philippe I, who ascended to the throne in 1830. The entire second floor (premier étage) of the aile du midi (south wing) of the palace was transformed into the Galerie des Batailles to house the newly created collection of paintings and sculptures depicting milestones battles of French history. The collections display painted, sculpted, drawn and engraved images illustrating events or personalities of the history of France since its inception. The museum occupies the lateral wings of the Palace. Most of the paintings date back to the 19th century and have been created specially for the museum by major painters of the time such as Delacroix, Horace Vernet or François Gérard but there are also much older artworks which retrace French History. Notably the museum displays works by Philippe de Champaigne, Pierre Mignard, Laurent de La Hyre, Charles Le Brun, Adam Frans van der Meulen, Nicolas de Largillière, Hyacinthe Rigaud, Jean Antoine Houdon, Jean Marc Nattier, Elisabeth Vigée Le Brun, Hubert Robert, Thomas Lawrence, Jacques-Louis David, Antoine Jean Gros and also Pierre-Auguste Renoir. Jennifer Saunders and Dawn French starred in a 1999 BBC comedy, set within the Palace, called Let Them Eat Cake . Singer-songwriter Al Stewart released a song entitled "The Palace of Versailles", detailing the French Revolution, The Terror, and the military coup of Napoléon Bonaparte, from the perspective of "the lonely Palace of Versailles". In 2012 animated film Madagascar 3, sophisticated chimpanzees Mason and Phil dress up as "King of Versailles" in reference to the Palace of Versailles. The Konami video game Castlevania: Bloodlines has Versailles as the fifth stage. The video games Assassin's Creed Unity and Assassin's Creed Rogue are set in Versailles at the beginning of Unity and the end of Rogue. In the Doctor Who (2005) episode "Girl in the Fire Place", The Doctor met the Madame de Pompadour in the Palace of Versailles. ↑ The marc, a unit equal to 8 ounces, was used to weigh silver and gold. ↑ As of 4 April 2008, silver has been trading in New York at US$17.83 an ounce. 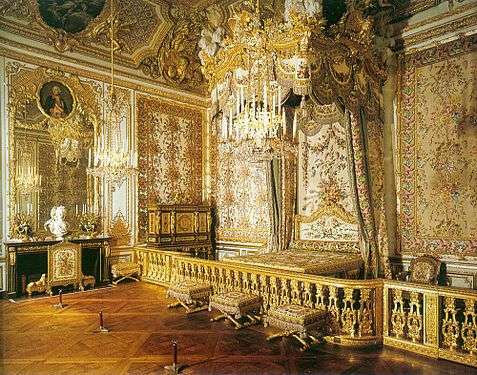 ↑ Six kings were born in this room: Philip V of Spain, Louis XV, Louis XVI, Louis XVII, Louis XVIII, and Charles X. ↑ Ayers 2004, pp. 334–336. ↑ Berger 1985a, pp. 17–19. ↑ Ayers 2004, pp. 336–339; Maral 2010, pp. 215–229. ↑ Hoog 1996, pp. 373–374. ↑ At the Court of the Sun King, Some All-American Art, New York Times (September 11, 2008). 1 2 William Safran, "France" in Politics in Europe (M. Donald Hancock et al., CQ Sage: 5th ed. 2012). ↑ Article 9: Le siège du pouvoir exécutif et des deux chambres est à Versailles. ↑ Associated Press, Breaking tradition, Sarkozy speaks to parliament (June 22, 2009). ↑ Jerry M. Rosenberg, "France" in The Concise Encyclopedia of The Great Recession 2007-2012 (Scarecrow Press: 2012), p. 262. ↑ Associated Press, The Latest: US Basketball Player James Not Going to France (November 16, 2015). ↑ Associated Press, The Latest: Brother Linked to Paris Attacks in Disbelief (November 16, 2015). ↑ Francois Hollande: 'France is at war', CNN (November 16, 2015). ↑ Georges Bergougnous, Presiding Officers of National Parliamentary Assemblies: A World Comparative Study (Inter-Parliamentary Union: Geneva, 1997), p. 39. ↑ "History of Art". Visual Arts Cork. Retrieved August 10, 2016. ↑ "Palace of Versailles". Dimensions Info. Retrieved August 10, 2016. ↑ Saule & Meyrer 2000, pp. 18, 22; Michelin Tyre 1989, p. 182. ↑ Blondel 1752–1756, vol. 4 (1756), book 7, plate 8; Nolhac 1898, p. 49 (dates Blondel's plan to c. 1742). Leloup, Michèle (7 August 2006). "Versailles en grande toilette". L'Express.